We’re launching Avaz 2.1 today. We are very excited about the new feature that we are introducing in this version. We think it’s a big game-changer! Every time we meet and talk to educators, therapists and parents, we hear the same complaints — too much work, too little time. We’ve kept raising the bar on how user-friendly Avaz is, and we’ve tried very hard to make it the easiest AAC app to use. Version 2.0, which we launched only a couple of months back, had several great features that received awesome reviews all-round. But today, we’re going one step further – from enhancing the app’s features to helping you create content on it. Avaz 2.1 allows you to download and incorporate new words and vocabulary into your copy of the app, and we promise to keep creating interesting, research-based vocabulary, that you can use right off-the-bat. Why is this useful? Well, for a child to use an AAC app effectively, the app’s vocabulary has to be tailor-made for different occasions. Whether it’s using AAC to go trick-or-treating during Halloween, or using it to tell the story with wizards and dwarves and princes, or just wishing grandma on her birthday – if a child cannot find the right words easily and effectively, their intent to communicate decreases significantly. 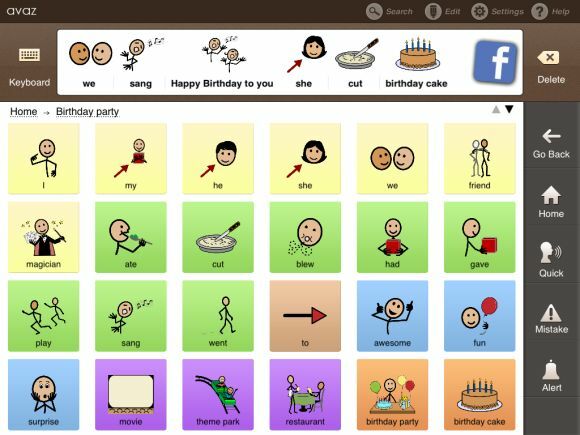 Creating new vocabulary sets is very easy in Avaz, but we’re going one step further, by having our team of AAC experts from around the world pre-create situation-specific and event-specific vocabulary sets for you. And we’re supplementing those sets with research-based tips and therapy hints, that will allow you to make the most from all this great new content. Download the new vocabulary set that is sent to you (with a .avz extension) on your computer. Transfer it to your iPad using either iTunes or Dropbox. You can now choose to add the downloaded vocabulary set to your existing Avaz vocabulary using the Restore option. We’ve put in a lot of thought and engineering effort into making Avaz better with every release, and we’re working on many new, exciting ideas for our next versions, too. But the feedback we’ve received from our beta-testers is that Avaz 2.1 is going to be a great help for parents, therapists, educators and children. Please write to us at support@avazapp.com and tell us what you think! We love hearing from you, and we promise you that we will try our very best to incorporate your suggestions and feedback into future Avaz versions.